As an MBA HR intern or fresher, you get to try on different roles in human resources and eventually you find a fit for a HR role to specialize in. So before you apply for HR internships or placements or even for MBA HRM course, take a closer look at various functions performed by HR department in organizations. That would give you a better idea about the career options after MBA HR or any other human resource management course. I can take you through a cut and dry list of functions of human resource which you may or may not be able to relate to as beginners. So why not get a perspective of HR roles as an employee of an organization and let’s analyze at what stage you, as an employee, can benefit from the functions performed by HR. When you are new to an organization, on first day usually, you are given information about the organization structure, its culture, work environment, facilities, policies, etc. That’s a part of new employee on-boarding, and one of the functions of Human Resource department. I remember fresh out of the college on my first day at work, HR had organized an orientation session. All freshers were introduced to various heads of the department. We were briefed about medical and other benefits, leaves, compliance, dress code, work environment, facilities etc. HR had also cracked some great bulk deals with two banks to help us open new zero balance salary accounts ;) So yes, on-boarding new employees- fresher and laterals- is an important function of HR. After all, you as an employee don’t want to join a new company and feel lost in your initial days. Similarly, HR wants to ensure that this new employee- employer relationship starts off on the right foot. As I mentioned above, you will get introduced to company policies as part of your on-boarding process. But who created those policies? The owner/ founder of the organization? It is not a one person’s job. HR helps create corporate policies and procedures. 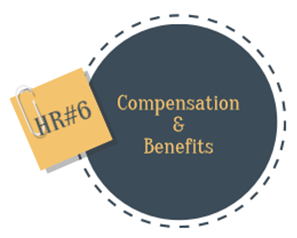 These policies cover all aspects of the functioning of the organization from recruitment, hiring, compensation, benefits, for workplace challenges and even managing discrimination issues. It is certainly not a routine job, but on ongoing process involves meeting specific regulatory requirements, etc. If you are already a MBA HR graduate or any equivalent course or even considering pursuing this MBA specialization, you can map the business/ corporate/ labour laws section of the syllabus to the policies created by HR. Now that you have joined this organization, someone needs to make sure that you are equipped to meet the basic competencies of the job. Of course, to get this job you exhibit some skills, but skills also need to be honed through training from time to time. Training and Development is one of the key functions of Human Resource department. For example, as a fresher you would have academic knowledge, so your organization could put you on to some training to give you the industry mold to get started. Consider another example where an experienced professional in your team wants to acquire some new skill to be able to do a particular task at work or a colleague undertakes some training to upgrade her skill set to move to more senior role. Employees need training sometimes on specific topics to meet the basic competencies for the job, sometimes as a part of the growth plan for promotions or even as a part of the overall professional development program. HR training and development team looks for learning opportunities in every-day activity and facilitates the same. Let’s now fast forward to the time when you are not new to this organization anymore. Over a period of time, you develop an emotional and functional commitment to your organization. But this enthusiasm, energy and commitment need to be maintained so that your performance levels remain high. The motivation and urge for innovation needs to be upped from time to time. That’s where employee engagement programs help organizations and is also handled by HR department. What you’ve read so far was just to give you an idea of the roles of HR and how and when the benefit of these HR functions reaches the employees. Before I wind up, let’s imagine that your fictitious team needs to hire one more person and you have been asked to initiate the hiring process. What would you do next? Directly go to LinkedIn or job portals and start hunting for candidates? Employees contact HR Recruitment team when they want to open a new job vacancy in the organization. HR recruitment department then prepares the final job description, posts on relevant job portals, scan applications, schedule interviews. For selected candidates, they prepare the job letter with compensation and benefit details and coordinate their joining dates. Then on their joining date, HR help in smooth on-boarding of new employees taking us back to our first point from where we started. Role of HR when understood can give a clear idea about career options after MBA HRM or any equivalent diploma course. These HR functions can be performed by being a part of the internal HR team of the organization or as an external HR consultant. Execution can be handled by HR specialists in that role or by HR generalists who can perform multiple HR functions by working closely with specialists. This post is informative. Keep at it. Thank you for sharing such information with us . If you are looking for Best Event Management Institute then NAEMD is Asia’s First Best Event Management Institute is the best solution . Amazing campus, experienced teachers staffs. Highly recommended!! !